All New Decor March 2019! New Comfy Gel Foam Sleeper Sofa. King Bed. Hallway Bunks for the Kids. 1.5 baths. Sleeps 6. Free Beach Service. PERFECT PATIO PLACE has a Spacious Living Room that opens to a Ground Floor Patio Sleep late in the Comfy King Size Bed Wake-up to your favorite morning TV show. Lovely fully equipped kitchen for your convenience and economy. Comfortable Casual Dining Hallway Bunks -- Fun for the Kids. Make it a fun adventure while on vacation. Find time to gather to watch a movie together on the Big Screen Comfortable Seating and a Queen Size Sleeper Sofa. Nicely equipped kitchen for your convenience. Large enough for a small family to stay comfortably Enjoy the ground floor patio new tile surface. A short walk to the beach. Patio View Toward Gulf -- Great dog walk. About 1 short block to the Beach. PERFECT PATIO PLACE. Plenty of light, spacious, with walk-out patio. Bathroom area has 2 sinks, 2 toilets and a shared private shower area. Bathroom area has 2 sinks, 2 toilets and a shared private shower area. Bathroom area has 2 sinks, 2 toilets and a shared private shower area. A washer/dryer in the condo keeps beach towels and wet suits clean and fresh. Enjoy the playful beach scenes in PERFECT PATIO PLACE Enjoy a free beach set-up during your stay. Umbrella and 2 chairs just for you The large beach side pool offers plenty of lounge chairs for relaxing. Enjoy the second pool. Near the clubhouse and tennis courts. Just steps away. At least once during your stay, experience the large hot tub, heated all year. Take a cool break from the sun under the Gazebo at the 2nd Pool. Hot tub too Keep your exercise routine if you like while on vacation. Two free tennis courts for Maravilla guests. First come, first serve Stunning beautiful sugar-white beaches and crystal blue water at Maravilla. The private gated beach means there`s room for you as a Maravilla guest. Popular Family Friendly Maravilla -- Scenic Gulf Drive Entrance Welcome to Maravilla -- Highway 98 Entrance Meet Your Friends at Pompano Joes for dinner. Just a short walk from Maravilla 4109. Glad you enjoyed PERFECT PATIO PLACE, Maravilla 4109. Please come again. 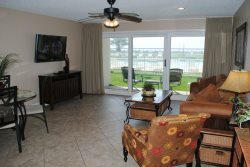 Our guests are happy to review Maravilla 4109. We are so excited to present this condo to our spring and summer 2019 guests! just steps to the Maravilla private beach and close to the North pool. It's the perfect location for your family's spring or summer vacation. This condo's owner has taken great care to redecorate her property for 2019 season guests. blending from the living area throughout the condo. This palette is perfect for a beach condo -- and the owner has outdone herself! New wall art greets her guests. New paint throughout. New curtains. New amenities in the kitchen. All very pleasing to the eye and elevating your guest experience at her property. and upgraded to a gel foam mattress (not springs). This is the most comfortable sleeper on the market today. of this cozy condo at popular Maravilla! The PERFECT PATIO PLACE...Book online today to reserve your vacation dates! As always, Free Beach Service provided (2 Chairs & Umbrella) March 9 - October 31. Small dog pet friendly. Free wireless high-speed internet. Call us at 423-899-3003 or Book Online Today! A Keurig coffeemaker. Bring your favorite K-Cups!